The below article originally appeared in the Genealogical Society of New Jersey (GSNJ) Newsletter, Volume 25, Number 1-2, Spring/Summer 2016 and is being re-published with permission of the Genealogical Society of New Jersey. Click the Above Image for the Full GSNJ Article. Plainfield, New Jersey is located near the junction of Middlesex, Somerset and Union Counties. 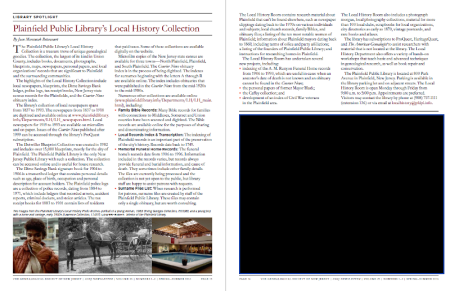 The Local History, Genealogy and Special Collections, housed in the Plainfield Room at the Plainfield Public Library (PLL), are a goldmine for researchers and family historians with roots in this region of New Jersey. The majority of the collection items may only be viewed in the Plainfield Room, but a visit to the Plainfield Room is worth the trip. For those who have researched GSNJ collections, you will find the PLL’s Family Bible records are a valuable supplement to the GSNJ Bible Records collection found at: http://www.gsnj.org/bible-records-index/. Since the GSNJ Newsletter article was published, indexes for the A. M. Runyon and Memorial Funeral Home records, Plainfield Police Logs and Tax Receipt Ledgers were digitized and are accessible on the library website. Indexes continue to be posted as they are created. Consult the staff to view the original records and ledgers. With new genealogy projects being initiated and digital files being added over time, DURH recommends visiting the Local History Collection website often for collection updates and news: http://www.plainfieldlibrary.info/Departments/LH/LH_main.html. A list of resources for additional New Jersey genealogy research in the Plainfield area is provided below. Copyright © 2015 DiscoverURhistory. All Rights Reserved.